If you have the guts for it, I have got to think it would be pretty cool to rappel down the Washington Monument. The view from up there is pretty cool, and you'd also be the first person in quite some time to inspect the world's first large casting of aluminum (100 ounces! ), which adorns the very tippy-top of the monument. When it was finished in 1884, aluminum was a very new and novel metal that was crazy expensive. New processes made aluminum much cheaper to manufacture, so the novelty of the cap became less cool just a few years after it was dedicated. 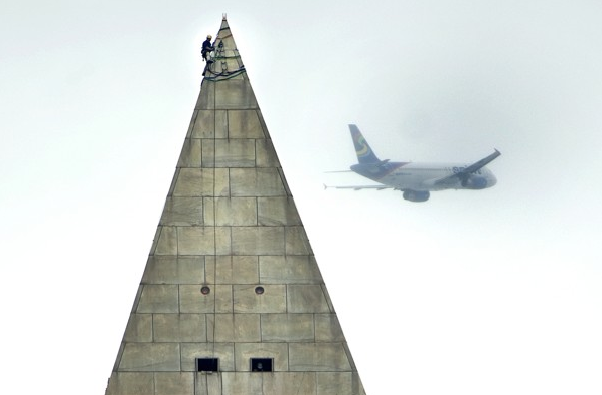 And if you haven't seen the video taken from atop the Washington Monument, it is well worth the 30 seconds of viewing. It's pretty impressive how much things rattle and shake. Here, I've even embedded it for you; just click.